How do you feel when your partner isn’t with you? Do you worry about who he or she may potentially meet, or might be spending time with? Do you frequently call or text to check-up? Do you need constant contact and reassurance of his or her feelings for you? Should you consider that instinct or paranoia? Use your rational thinking to decide whether you have good instincts that you should trust, or you’re just paranoid and ruining what could be a good thing. Unless you’ve chosen to be with a player or known philanderer, it’s most likely your insecurity that’s creating your suspicions. Paranoia is cancerous to relationships. If you’re afraid your partner doesn’t want you as much as you want him, you’ll usually start to reject him out of insecurity, or you may become needy and smothering—hanging on for dear life. Reject when you feel rejected. Putting up an emotional wall to protect yourself that prevents you from getting close to someone you truly want. Compete with him or her to prove your worth and show you’re good enough. Manipulate by using guilt or blame, or by playing the victim. Sabotage by creating arguments over nothing or acting out. Jealous of others that you perceive your partner finds more attractive—which only makes you less appealing. Joined at the hip. You want to do everything together and don’t trust him or her out of your sight. You keep your thoughts, needs, and desires to yourself because you fear that if he really knew you, he wouldn’t love you. All of these actions, conscious or not, drain your energy because they put your happiness in the hands of someone else. When you succumb to your fears by taking insecure action, the result is usually what you fear most: you push him away and he leaves you. Alternately, when you choose to face your fears and accept responsibility for them, you can gain wisdom to make your relationships better. Start by trying to pinpoint the source of your insecurity. When you catch yourself getting all worked up and wanting to react to something you think is going on…stop! Ask yourself what the facts are. Only respond to what is actually going on, not what you think or fear is happening. Don’t confuse a pre-programmed response to your own baggage for an instinct. You have to know yourself. Are you highly jealous? Do you hate to be alone? Need a lot of attention? Perhaps you just don’t feel desirable enough. If you’ve been burned before, you’re most likely gun-shy and reacting to your current partner as you did to your ex. Or maybe you have a tendency to cheat, in which case you’re projecting your own behavior on him or her. Whatever it is, it’s not fair—or healthy. You need to stay in the moment and only react to the reality in front of you. Don’t make everything personal and assume it’s about you. It’s usually not, and that’s ok. Don’t rush things, be patent. You have to stop trying to control anyone else; you can only control yourself. In all probability, the thing making you jealous is low self-esteem. If you don’t truly feel lovable, how can you possibly believe or trust anyone who says he or she loves you? FDR very wisely said, “The only thing we have to fear is fear itself.” I could devote an entire book to the symptoms and resolutions of every fear that gets in the way of healthy relationships (Giving Up Junk-Food Relationships describes many of them). But what it all boils down to is love yourself completely and maintain your power. You need to build your self-esteem by giving yourself the attention you crave. And don’t be afraid to show a little vulnerability to the person you love, if he or she loves you it will only make them love you more. If you need more help recognizing what you’re doing wrong or finding who could be right for you I offer personal coaching. 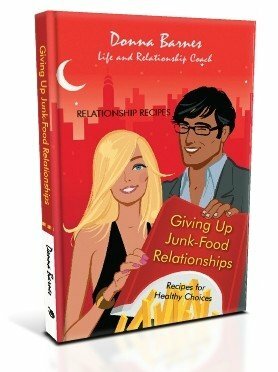 Learn more about creating a healthy relationship and enforcing healthy boundaries in my book Giving Up Junk-Food Relationships: Recipes for Healthy Choices. I wrote this book to help you have happy relationships and more importantly avoid bad ones. Bad relationships are pretty much the same as junk food. "A welcome addition to the self-help genre that aims to heal body and mind." Sign up for personal coaching. My hours are flexible and I'm easy to talk to.